Probably based first in Castle, Indiana, about thirty miles east of Indianapolis, the Chard company was to be bought by the Western Machine Tools Works of Holland, Michigan - a Company that survived until 1992 but whose plant not finally cleared until 1999. 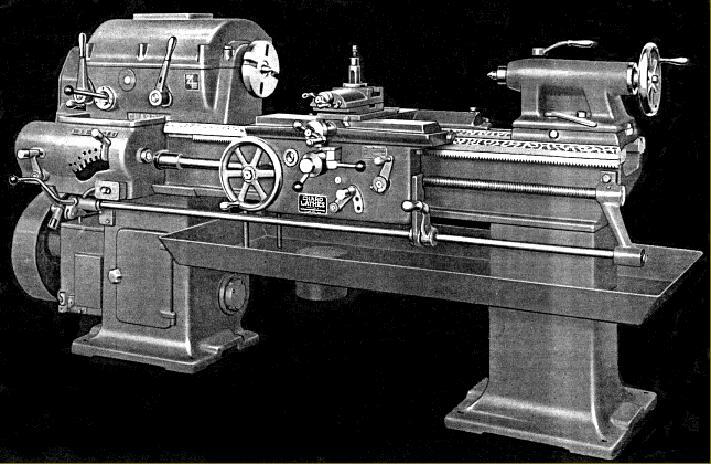 Chard lathes shown on these pages were available during the late 1930s and early 1940s; of conventional layout they well built and incorporated several features designed to improve their rigidity and turning performance. The entire drive system, comprising the speed-change gearbox, clutch and spindle brake were mounted within the headstock cabinet leg and drove up to the headstock through a "silent chain". This principle (used on many toolroom lathes) of positioning the mass of the heavy drive system close to the floor, and away from the main spindle, helped to isolate the inherent vibration of the running gears, reduced stress within the headstock casting, helped reduce chatter marks on finely-finished workpieces and added to the general stability of the machine. A motor, contained within the base, drove the gearbox by V-belts; the input pulley being mounted on ball bearings, contained within a "horn" that extended from the gearbox casing. Built into the drive pulley was a multi-disc clutch that could be operated by two levers, one mounted by the headstock and the other fastened to the right-hand face of the apron and travelling with it. All gears were in a high-grade alloy steel with their bores concentrically ground to the pitch line. Shafts within the gearbox were ground, mounted on ball bearings, and automatically lubricated by the splash of the rotating gears in their oil sump - which was provided with a combination filler and drain plug. The base of the cabinet leg also contained an oil sump from where oil was pumped, under pressure, through an adjustable relief valve and filter unit to all bearings in the headstock, from where it was returned, after use, to repeat the cycle. A cone brake, synchronised in operation with the clutch-release movement, was provided for instant stopping of the spindle, and actuated by the same two levers as the clutch. All four speed changes from the gearbox were selected with a single lever, mounted on the headstock's front face. A positive interlock prevented the operator engaging different speeds simultaneously, and each ratio was held in its operating position by detents within the gearbox itself. The final drive to the headstock spindle was by sprocket and silent-chain with an adjustable tensioner provided to take up wear. All Chard beds were of the Vee-and-flat type, made from close-grained, semi-steel, chill hardened and of full depth for their entire length - there was no reduction of wall height towards their middle section. Together with cross bracing, at frequent intervals, this produced a bed of exceptional rigidity and strength. Surprisingly for so large a lathe the headstock spindle had a screw thread - of 23/8" diameter by 6 TPI on the 16" lathe and 23/4" by 5 TPI on all the larger ones - although a taper key-drive (National Standard) LO fitting was offered as a no-cost extra. The 16" and 18" lathes had 8 spindle speeds of 18, 25, 36, 52, 181, 249, 350 and 508 r.p.m. or, optionally (with not much of an improvement) 55, 76, 107, 156, 181, 249, 350, and 508 rpm. A 12 speed option was also available, but the range still stayed within the limits of 18 to 508 rpm. Larger lathes were geared appropriately wit j8 speeds of 12, 17, 24, 35, 149, 205, 289, and 419 rpm or the option of 42, 58, 82, 119, 149, 205, 289, and 419 rpm. The 12 speed option gave revolutions between 12 and 419 per minute. There was no separate power shaft for sliding and surfacing feeds, instead, copying smaller lathe practice, the leadscrew was slotted and passed through a worm wheel within the apron and drove it through a sliding key..
Chard 16" multi-speed Quick-Change Screwcutting Engine Lathe with V drive belt though a ball-bearing gearbox. Timken bearing headstock. Made in 16", 18" and 20" sizes and fitted with a twin-disc clutch.